Religious movement initiated by Martin Luther in the 16th century to reform the Roman Catholic Church. The Protestant Reformation was a Christian reform movement in Europe. It is thought to have begun in 1517 with Martin Luther's Ninety-Five Theses and may be considered to have ended with the Peace of Westphalia in 1648. Martin Luther's spiritual predecessors included men such as John Wycliffe and Johannes Hus, who had attempted to reform the church along similar lines. The Reformation can be said to have begun in earnest on October 31, 1517, in Wittenberg, Saxony (in present-day Germany). Although probably myth, there, Luther nailed his Ninety-Five Theses to the door of the All Saints' Church, which served as a notice board for university-related announcements. God rules the worldly or left-hand kingdom through secular (and, though this point is often misunderstood, also churchly government, by means of law [i.e., the sword or compulsion]) and in the heavenly or right-hand kingdom (his spiritual kingdom, that is, Christians insofar as they are a new creation who spontaneously and voluntarily obey) through the gospel or grace. This doctrine, the two kingdoms doctrine is a Protestant Christian doctrine that teaches that God is the ruler of the whole world, and that he rules in two ways. The doctrine is held by Lutherans and represents the view of some Calvinists. A sermon by Martin Luther on this from 1528 preached on the 19th Sunday after Trinity in Marburg, about the Two Kingdoms or Two Kinds of Righteousness, he states that the worldly (left hand) Kingdom includes everything we can see and do in our bodies. This fully and especially includes whatever is done in the church. This is taught so that it is clear that in the Heavenly (right hand) Kingdom, the only thing that is included there is alone faith in Christ. "Christ alone" and "faith alone" are Lutheran slogans that are reflected in this way. The biblical basis for this doctrine, is the distinction St Paul makes in Romans 8 between the physical body and the spirit. This marks Martin Luther's break with the traditional scholastic understanding of Romans 8. The Scholastics understood that in this dichotomy the flesh was vice, profane and secular, while the spirit was virtue, sacred and churchly. Luther saw this contrast instead to be a movement from true virtue, which especially included the sacred and churchly and any righteousness we can do or that is visible, to alone the invisible righteousness of faith in Christ, which in the sermon referenced here he says is "meaningless on earth except to God and a troubled conscience." The most controversial points centered on the practice of selling indulgences and the Church's policy on purgatory. Other reformers, such as Ulrich Zwingli, soon followed. Beliefs and practices under attack by Protestant reformers included purgatory, particular judgment, devotion to Mary, the intercession of and devotion to the saints, most of the sacraments, the mandatory celibacy requirement of its clergy (including monasticism), and the authority of the Pope. The reform movement soon split along certain doctrinal lines. Spiritual disagreements between Luther and Zwingli, and later between Luther and John Calvin, led to the emergence of rival Protestant churches. The most important denominations to emerge directly from the Reformation were the Lutherans, and the Reformed/Calvinists/Presbyterians. The process of reform had decidedly different causes and effects in other countries. In England, where it gave rise to Anglicanism, the period became known as the English Reformation. Subsequent Protestant denominations generally trace their roots back to the initial reforming movements. The reformers also accelerated the Catholic or Counter Reformation within the Catholic Church. The Protestant Reformation is also referred to as the German Reformation, Protestant Revolution or Protestant Revolt. "Matthew is an ordinary-looking man. He sits center-foreground in an idyllic landscape holding a blank sheet of paper and a pen. There are ruins of a classical temple around him. 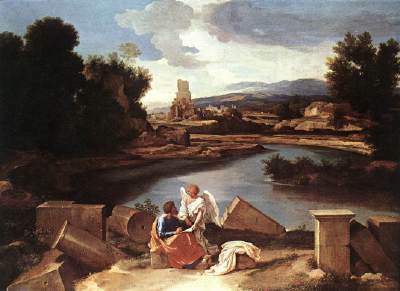 He is near the bank of a river, which takes up most of the center of the work, winding through the painting into the distance where there are further ruins, mountains, and a partly cloudy but vivid sky. A golden-haired angle has appeared next to Matthew. His robe is white, as are his wings. His arms and right shoulder are bare, a lovely pale flesh. 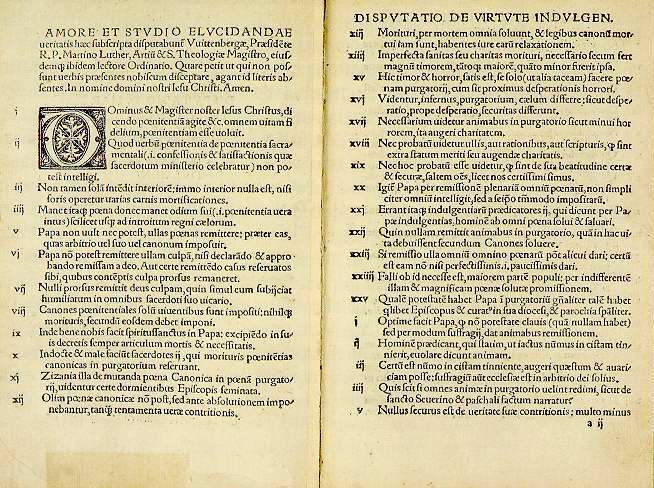 His left hand lightly holds the top of Matthew’s page; the right points to where the text should begin. He is inspiration, bringing to this common mortal the sacred word. The pen is in Matthews right hand. He gazes up into the angle’s face. The angle looks down joyfully. Matthew is concentrating on his most important act, what he was called to do, finding the appropriate voice to tell the story of Jesus, the man who transformed his life. So far his own dullness has meant that he remains blind; his mind, like the rest of him, blank. But an angel has arrived, and on the instant Matthew is more than his lackluster, everyday self. The pen races across the page. At long last he can fulfill his vocation. The scene is an ideal landscape bathed in reverence and peace. Nature itself echoes the mood, a tranquil yet alert clarity. Even the ruins of human creation are a part of the divine harmony. With their double symbol of transcedence through grace of the mundanely human, and of transforming Greek classical culture through Jesus into a higher plane. Here is revelation, but not with lightning and thunder. Poussins angel is gentle and helpful. The Reformation Wall honours many of the main individuals, events, and documents of the Protestant Reformation by depicting them in statues and bas-reliefs. 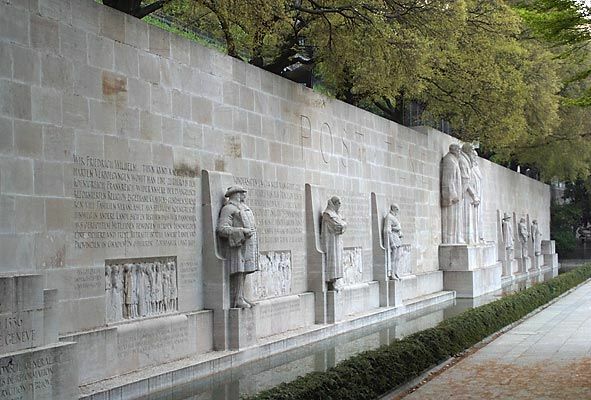 The Wall is in the grounds of the University of Geneva, which was founded by John Calvin, and was built to commemorate the 400th anniversary of Calvin's birth and the 350th anniversary of the university's establishment. The monument represents the fortifications' integral importance to the Reformation. Due to the close connections to Protestantism, the individuals most prominently depicted on the Wall were Calvinists: Theodore Beza, John Calvin, William Farel, John Knox, William the Silent, Gaspard de Coligny, Frederick William of Brandenburg, Roger Williams, Oliver Cromwell and Stephen Bocskay. The monument gave inspiration to one of the most important 20th century Hungarian poems, written by Gyula Illyés in 1946 under the title Before the Monument of Reformation in Geneva.